Continuing our coverage of the Seattle striptease stars who will be competing at the Burlesque Hall of Fame next month, let us turn our attention to the other half of the Original twins, Trojan Original, who will compete for the title “Best Boylesque”. 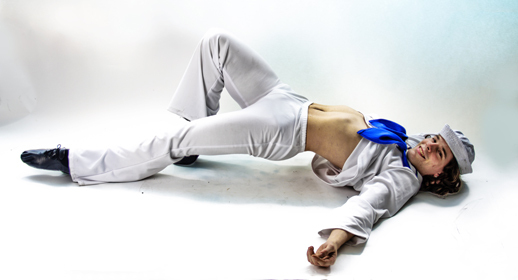 This statuesque hunk is a prolific performer, photographer, and videographer and is one-third of the incomparable boylesque trio Mod Carousel (along with brother Paris and The Luminous Pariah). Trojan has made many a jaw hit the floor with his dancing skills and flexibility, and his absolutely raging sexuality and stage presence are downright obscene (in the best way). A single look from this guy is enough to make even the most stoic audience sweat, swoon, and gush. Burlesque Seattle Press: What’s your performance background? How did you get into burlesque? Trojan Original: My performance background is in theater and dance. When I was 15 my brother (Paris) and I got into acting at our local community theater. I won’t speak for him but I know I was far from stellar at acting (and can’t sing to save my life) but it did instill a LOT of theory about how to take command of a stage. A few years later we got into dance classes more or less by fluke and I liked that much better. I think what I liked about it was that I didn’t have to talk at all. Anyway, we jumped from studio to studio trying to find better and bigger places to dance in and it eventually led to dancing professionally in Seattle. I more or less got into burlesque because of Paris (he had been introduced to it a few months before I did by The Luminous Pariah). We had a good ballet friend who was getting married and the two of us took it upon ourselves to be her bachelorette party entertainment and created our first burlesque act: a male stripper, two-person spoof of Swan Lake, her favorite ballet. After that we answered a Craigslist add for a new troupe, did our first “official” burlesque show and it took off from there. BSP: How do you feel about performing at the Burlesque Hall of Fame? TO: I like performing at BHoF. There’s a lot of pressure with it being the most prestigious international competition and all, but it’s well worth it. I was against the thought of going to BHoF for a long time because I felt that good performers shouldn’t need titles to help their careers along. But I’ve since come to terms with the fact that participating in festivals is really the quickest way to get national and international recognition, and that recognition is vital for touring especially. Now that I’ve been to BHoF once, I’m hooked and would love to go every year I can afford to. TO: I’m not really. I’ve done this act a lot since I created it and it’s honestly one of the easiest acts I have to perform. There’s no tumbling, splits, crazy jumps, split timing, or need to warm up or even stretch for this one so there’s not much for me to do until I get to Vegas. I’m sure once I’m there it’ll hit me more and I’ll be rehearsing in my hotel room but as it stands I’ve done exactly nothing to prepare. BSP: I can’t believe you’re not prepping at all!! You’re not nervous? TO: I can’t say I’m nervous yet. I haven’t paid much thought to it at all so it still seems far away. I think it’ll kick in once I get to Vegas and especially right before I have to perform. TO: We haven’t competed in a performance environment in a really, really long time, (I think the last time was a dance competition when we were 19), but I wish him the best. I’d be super happy if either of us took the crown. If one of us gets it this year, then I hope the other gets it in the following years. TO: Watch a lot of burlesque and take notes of what you like and don’t like. Stage presence can’t be taught but it’s vital in burlesque and watching other performers will give you a lot of insight about its inner workings. ~ by angrytruffle on 05/27/2014.